Do you want to have a flawless, glowing skin, a shapely body, and shiny hair? 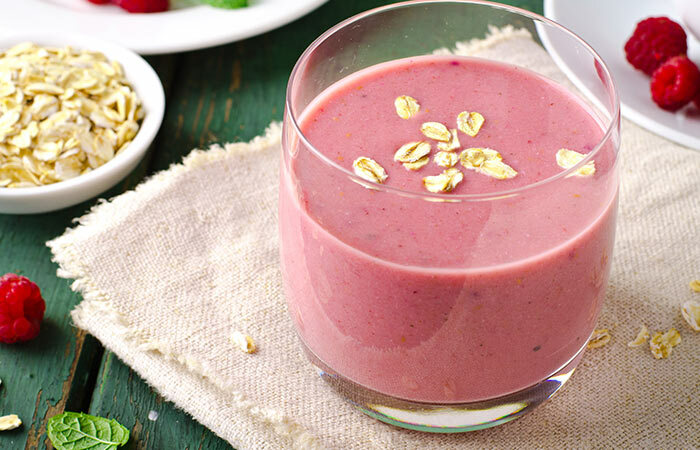 Try drinking detox smoothies for breakfast every day. 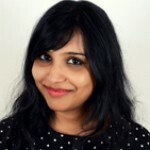 I can tell you from first-hand experience that drinking nutrient-rich detox drinks will take care of all your problems be it breakouts, dry skin, hair fall, hormonal imbalances, digestive problems, weight gain, or compromised immunity. 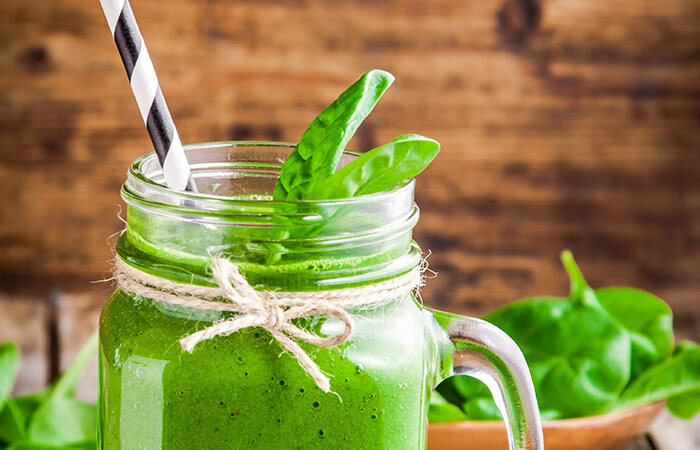 Detox smoothies work so effectively because they are made from fruits, veggies, seeds, nuts, herbs, and spices that are rich in vitamins, minerals, phytonutrients, and dietary fiber. 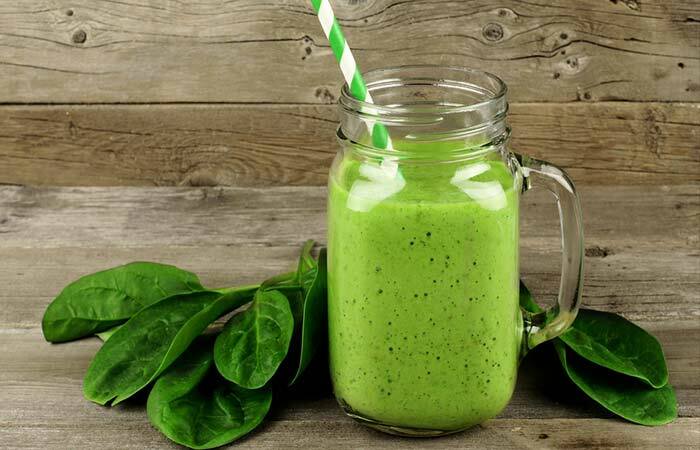 Though drinking spinach smoothie doesn’t seem so palatable, the recipes listed here are absolutely delicious, takes 5 minutes to prepare, and pocket-friendly. So, no more pricey surgeries or treatments! 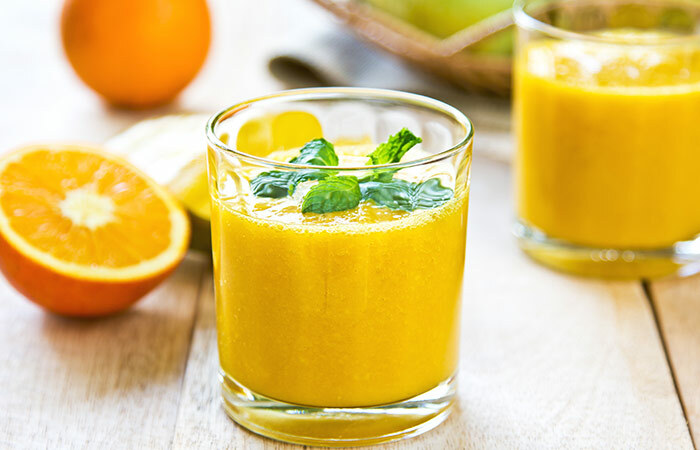 Drink these natural, homemade, and colorful detox smoothies to reinvent yourself. Scoop the avocado flesh out and cut it into medium-sized cubes. Peel the kiwi and toss it along with the avocado cubes into the blender. Cut the celery stick in half and toss it into the blender. Add a few mint leaves, sunflower seed powder, and a pinch of salt and give it a spin. Add some freshly ground peppercorn before you drink the smoothie. Avocados are rich in antioxidants such as neoxanthin, chrysanthemaxanthin, lutein, vitamin E, and vitamin C (1). The phytonutrients and vitamins present in kiwi help to protect the DNA from damage, scavenge harmful free radicals, protect from arthritis, asthma, colon cancer, macular degeneration, and improve cardiovascular health (2). Celery is a good source of antioxidants that protect you from gastrointestinal inflammation, atherosclerosis, and many types of cancer (3). Mint is rich in vitamins A, C, and B-complex, and minerals such as magnesium, iron, and calcium. It supports the digestive system and prevents microbial infection and cell damage (4). Wash all the fruits before you cut or juice them. Blend the baby kale leaves, watermelon, grapes, and a few mint leaves. Add the juice of half a grapefruit, a pinch of salt, pepper, and stir well. Kale is an excellent source of vitamins A, C, and K, copper, manganese, calcium, potassium, and dietary fiber. These help to lower cholesterol, aid weight loss, improve cardiovascular health and fight cancer (5). Grapes are a good source of vitamins K, B2, and C, and copper. The resveratrol present in grapes plays an important role in increasing the longevity (6). Grapes also regulate the blood sugar levels, improve cognitive functions, and protect against microbial infections . Watermelons contain lycopene that improves cardiovascular health and cucurbitacin E that scavenges reactive oxygen radicals. The part nearest to the rind has the greatest concentration of antioxidants, vitamin C, and flavonoids. These help to reduce weight, relax the muscles, and regulate blood pressure (7). Grapefruit scavenges free oxygen radicals, thus helping to fight cancer and lower blood cholesterol. It also aids weight loss (8). Mint supports the digestive system, prevents microbial infection, and prevents cell damage (9). Remove the stems, roughly chop the spinach leaves and cucumber and toss them in a blender. Toss in a handful of mint leaves and add a pinch of salt. Give it a spin. To make the roasted cumin powder, take two tablespoons of cumin seeds and fry them without oil in a frying pan. Grind the roasted cumin seeds and store in an airtight glass jar. Transfer the spinach smoothie to a glass, add the juice of half a lemon and half a teaspoon of roasted cumin powder. Stir well. Spinach is an excellent source of nutrition. It protects you from various types of cancer, macular degeneration, and strengthens bones (10). Cucumbers are rich in lignans such as pinoresinol, lariciresinol, and secoisolariciresinol that improve cardiovascular health. The cucurbitacins A, B, C, D, and E help to fight cancer (11). Mint is rich in vitamin A, vitamin C, vitamin B-complex, and minerals such as magnesium, iron, and calcium. It supports the digestive system, prevents microbial infection, and prevents cell damage (12). Lemons are a good source of vitamin C, which protects against rheumatoid arthritis, supports digestion, and fights mouth, breast, skin, and colon cancer (13). Cumin seeds are rich in iron and help in the formation of red blood cells and aid digestion and weight loss (14). 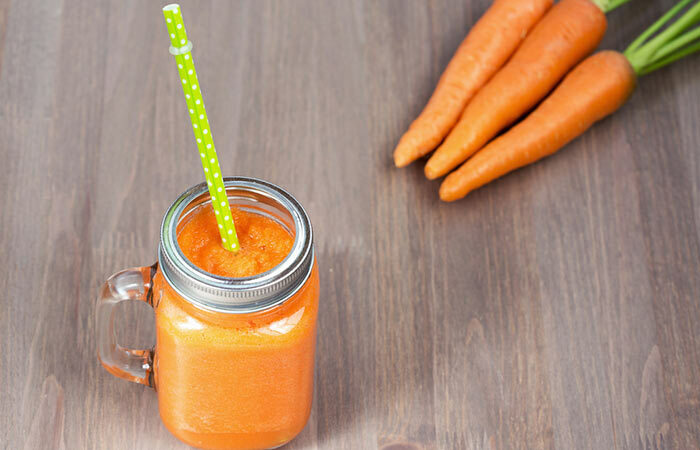 Chop the baby carrots, tomato, celery, and coriander leaves and toss them into a blender and give it a spin. Fry two tablespoons of cumin seeds without oil in a frying pan. Grind the roasted cumin seeds and store in an airtight glass jar. 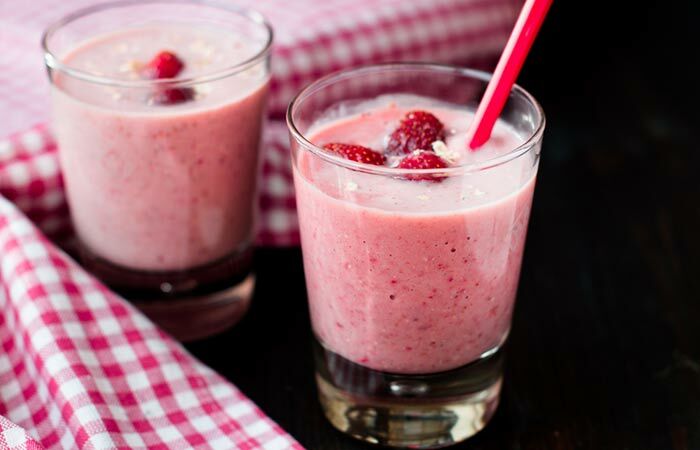 Transfer the smoothie to a glass and add the juice of half a lemon, a little freshly ground pepper, and a pinch of salt. Stir well. Carrot is rich in vitamins A, K, C, biotin, fiber, antioxidants, and minerals. It helps to improve the cardiovascular system and eye health and lower the risk of colon cancer (15). Tomatoes are rich in lycopene, which improves bone health. Fresh tomatoes lower blood cholesterol and the risk of atherosclerosis and protect from various types of cancer (16). Celery is a good source of antioxidants that protect against gastrointestinal inflammation, atherosclerosis, and many types of cancer (17). Lemons are a good source of vitamin C that helps protect against rheumatoid arthritis, supports digestion, and fights mouth, breast, skin, and colon cancer (18). Cumin seeds are rich in iron. They aid the formation of red blood cells, support digestion and weight loss, and protect against liver and stomach cancer (19). Coriander leaves have high vitamin A and vitamin K content. They are also rich in minerals such as calcium and potassium. Coriander leaves are helpful in treating indigestion, curing skin and menstrual disorders, maintaining blood sugar and cholesterol levels, and improving vision (20). Toss the tender coconut, strawberries, blueberries, and mint leaves into a blender. Carefully take out the seed from the gooseberry, cut into four pieces and throw into the blender and give it a spin. Add the coconut water into the blender and spin it for three seconds. Tender coconut water is an excellent source of electrolytes, vitamins, proteins, and fiber. It helps to regulate blood sugar levels, aids weight loss, and cleanses the colon (21). Strawberries are rich in vitamin C, manganese, and fiber. These red and luscious fruits have antioxidant and anti-inflammatory properties. They also help in regulating the blood sugar levels (22). Gooseberries are loaded with vitamins, minerals, antioxidants, and dietary fiber. These help improve skin, hair, and heart health and boost immunity (23). Blueberries are rich in antioxidants that help to improve brain function, cardiovascular health, and eye health, regulate blood sugar levels, and protect against cancer (24). Mint aids digestion and prevents microbial infections (25). Wash all the fruits before chopping. Cut the apple and throw out the seeds. Take the seeds out of the lychees. 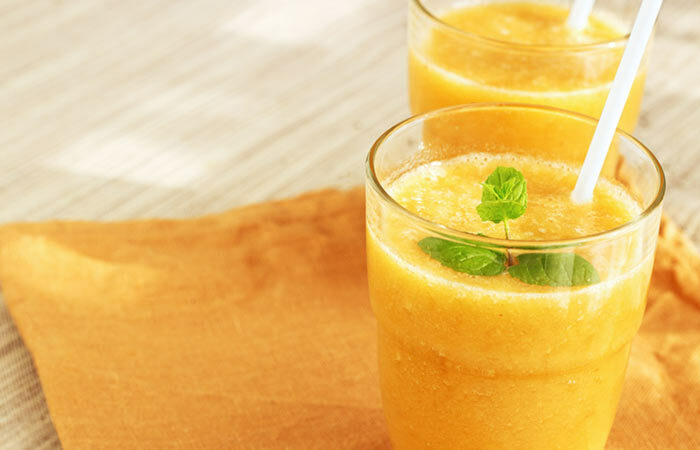 Throw in all the fruits and mint leaves into the blender and give it a spin. Add a dash of lemon juice and black salt. Stir well. Pineapple contains cysteine proteases that help in digesting proteins. It also contains bromelain, which not only helps in digestion but also acts as an anti-inflammatory agent (26). Apples are nutrition-dense fruits that help protect from asthma attacks, fight cancer, and regulate the blood sugar levels (27). Lychees contain oligonol that prevents viral infections, aids weight loss, and improves blood circulation (28). Pomegranate prevents type II diabetes, cancer (prostate and breast), and heart disease. It is also beneficial for those who are suffering from arthritis, blood pressure, skin diseases, and cognitive disorders. It improves memory and blood circulation (29). Papaya is a rich source of vitamins, minerals, and most importantly, papain, the digestive enzyme. It helps to combat constipation, makes the cardiovascular system stronger, and also fights colon cancer (30). Lemons are a good source of vitamin C that supports digestion and helps fight various types of cancer (31). Mint aids digestion and prevents microbial infections and cell damage (32). Peel and cut the banana and toss into the blender. Cut the passion fruit and scoop out the fruit into the blender. Bananas are rich in potassium that helps to regulate blood pressure. The sterols in banana help to keep a check on cholesterol levels in the blood. Bananas are also a good source of dietary fiber that helps in digestion as well as weight loss (33). Flaxseeds have a high polyphenol antioxidant content, which helps to detoxify the body. They also aid weight loss, prevent cardiovascular diseases, as well as decrease insulin resistance (34). Passion fruit is rich in vitamins A and C, dietary fiber, minerals, and antioxidants. It helps fight oral and lung cancers, regulates blood pressure, protects against flu, and helps to maintain good cell membrane health (35). Milk is a great source of calcium, protein, fats, and good carbs. Milk helps to strengthen bones and regulate blood pressure (36). Almonds help to lower cholesterol levels and protect from diabetes and high blood pressure (37). Wash the ginger root thoroughly and scrape the peel off using a knife. Cut the ginger root and toss into the blender. Peel the orange and kiwi and toss them into the blender. Toss in the green grapes and a few mint leaves. Give it a spin. 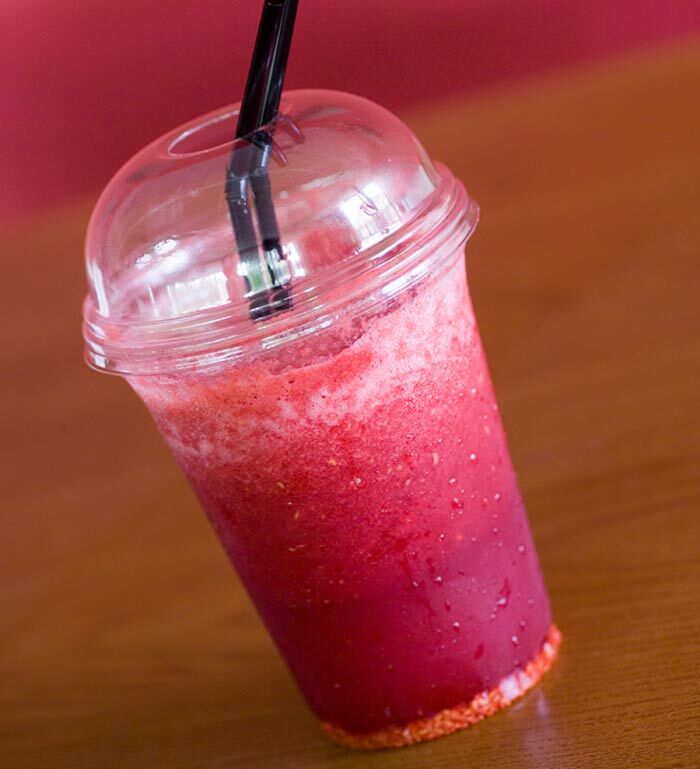 Transfer the smoothie to a glass, add a pinch of black salt and stir well. Ginger is used in many recipes and is a good source of antioxidants. It has anti-inflammatory properties and soothes the gastrointestinal tract (38). The phytonutrients and vitamins present in kiwi help to protect the DNA from damage, scavenge harmful free radicals, protect from arthritis, asthma, colon cancer, and macular degeneration, and improve cardiovascular health (39). Grapes are a good source of copper and vitamins K, B2, and C. They contain resveratrol, which helps increase the lifespan. Grapes also regulate the blood sugar levels, improve cognitive functions, and protect against microbial infections (40). Oranges are full of vitamin C and fiber. This makes them an excellent source of antioxidants. Oranges also lower blood cholesterol levels, prevent kidney stone formation, reduce the risk of ulcers, stomach, and lung cancer, and protect against rheumatoid arthritis and cardiovascular diseases (41). Mint is rich in vitamin A, vitamin C, vitamin B-complex, and minerals such as magnesium, iron, and calcium. Mint supports the digestive system and prevents microbial infection and cell damage (42). Wash the spinach leaves thoroughly, chop them roughly, and toss into the blender. Peel the garlic cloves and toss them into the blender. Toss in the boiled sweet corn and add the juice of half a lime. Add a pinch of salt and give it a spin. Spinach is a highly nutritious food. It fights against cancer, strengthens bones, and prevents macular degeneration (43). Garlic helps to fight cancer, metabolize iron, and prevent microbial infections (44). Sweet corns are rich in carotenoids, fiber, and vitamins that help to regulate blood sugar levels and support digestion (45). Lime is very helpful in regulating digestion. It helps with gastritis, heartburn, and constipation (46). 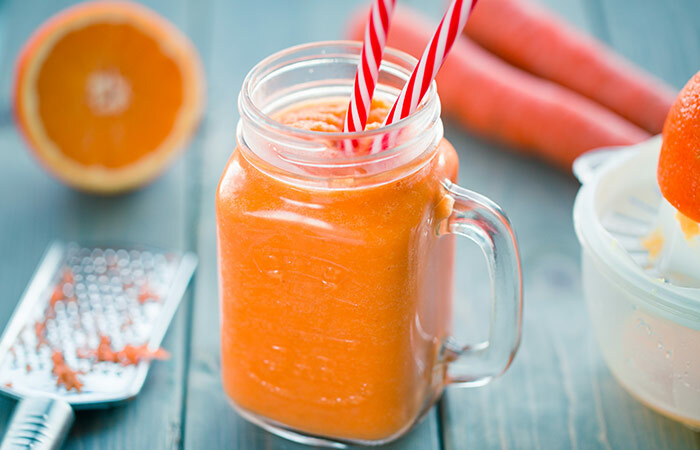 Chop the baby carrots, celery, and broccoli florets and throw them into a blender. Boil water and dip the green tea bag for five minutes. Add the green tea extract to the blender. Toss in the grapefruit, honey, roasted cumin powder and a pinch of salt and give it a spin. Grapefruit is rich in vitamin C and lycopene (an anticancer agent). It lowers cholesterol, cleanses the liver, has antioxidant properties, and prevents the formation of kidney stones (47). Carrots help in weight loss, improve vision, boost cardiovascular health, and also fight cancer (48). Honey contains a myriad of vitamins and minerals, and it helps in metabolizing cholesterol and fatty acids and supports digestion (49). Green tea boosts immunity and is a good source of catechins, which are a type of antioxidants. They scavenge the toxic oxygen radicals, thereby slowing down aging and preventing the proliferation of cancer cells (50). Cumin seeds are rich in iron and help in the formation of red blood cells. They also aid digestion and weight loss and protect against liver and stomach cancer (51). Celery helps to soothe the digestive tract and protects from colon cancer and atherosclerosis (52). Broccoli has antioxidant and anti-inflammatory properties, which make it the ultimate detoxifier. It supports digestion and improves heart health (53). 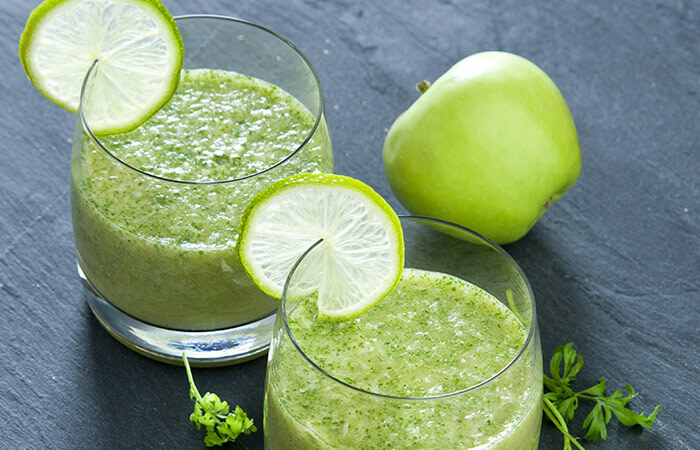 Chop the apple and spinach and toss into a blender. Add the lemon juice and give it a spin. Stir in a pinch of salt and cayenne pepper before drinking. Apples are rich in antioxidants, phytochemicals, and dietary fiber. They help in weight loss, protect against cardiovascular diseases, and prevent uncontrolled cell division (54). Spinach helps lose weight by increasing satiety, reducing food cravings, and mobilizing fat (55). Lemons increase the enzymes involved in ß-oxidation, therefore helps to mobilize fat (56). Chop the celery stalks and beetroot. Toss into the blender. 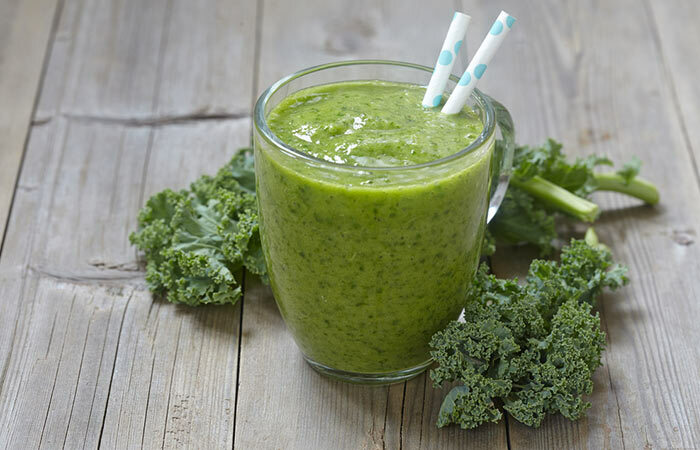 Add the grapefruit juice and kale to the blender and give it a spin. Pour it into a glass, add black salt, and stir well. Celery is a low-calorie veggie that helps to lose weight by increasing satiety and utilizing stored fat as energy to carry out the body functions (57). Beetroots are a rich source of vitamins, minerals, antioxidants, and other phytonutrients that help to improve immunity and reduce cardiovascular disease risk (58). 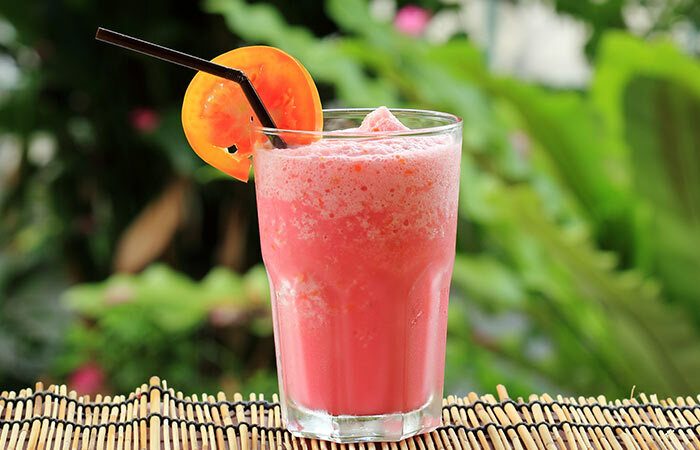 Consuming grapefruit juice helps to reduce weight and also increases insulin sensitivity (59). Kale lowers LDL levels in the blood, is a rich source of dietary fiber, and prevents cardiovascular diseases (60). Roughly chop the carrot and ginger. Toss into the blender. Add chopped leek, orange, and lemon juice. Give it a spin. Pour into a glass and add apple cider vinegar and salt. Carrots are rich in antioxidants and phytonutrients that help to protect against poor vision, atherosclerosis, and cancer (61). Oranges are a good source of vitamin C that helps boost immunity and lose weight (62). Leeks contain a substantial amount of polyphenols that help to reduce weight, protects against diabetes, allergies, and rheumatoid arthritis (63). Ginger is rich in antioxidants, vitamins, and has anti-inflammatory properties. It aids digestion and works effectively against motion sickness and nausea (64). Lemons are rich in vitamin C and it increases the levels of enzymes that help in fat metabolism (65). Soak the fenugreek seeds overnight in a cup of water. In the morning, strain the water and throw away the seeds. Chop the plum and toss into a blender. Add the mint leaves and fenugreek seeds soaked water. Fenugreek seeds have lipid lowering and antioxidant properties. It also prevents lipid and glucose absorption (66). Plums have phytonutrients that help in absorption of iron, lowering blood sugar and bad cholesterol levels (67). Mint leaves soothe the digestive tract, helps in lowering bad cholesterol and blood pressure, and effectively relieves muscle pain (68). 1. 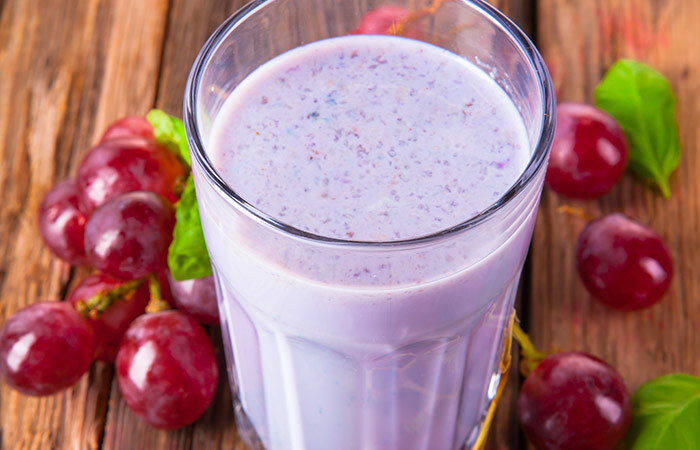 Toss the reg grapes, banana, raspberries, and almonds into a blender. 2. Give it a spin and pour it into a glass. 3. Add a pinch of black salt and stir well. Grapes have antimicrobial, antioxidant, anti-inflammatory, and anticancer properties.It also slows down aging and lowers blood sugar levels (69). Though bananas may seem like fattening food, it has numerous other health benefits that indirectly aid weight loss. It is rich in vitamins and minerals, stimulates digestion, prevents cardiovascular diseases, and improves muscle power (70). Sweet and sour raspberries are rich in antioxidants and have anti-inflammatory properties. It is an anti-obesity agent and helps to control the blood sugar levels (71). Almonds are rich in healthy fats and also has a probiotic effect thereby helping proper digestion of food (72). Dip the green tea bag into half a cup of hot water. Let it cool down to room temperature. 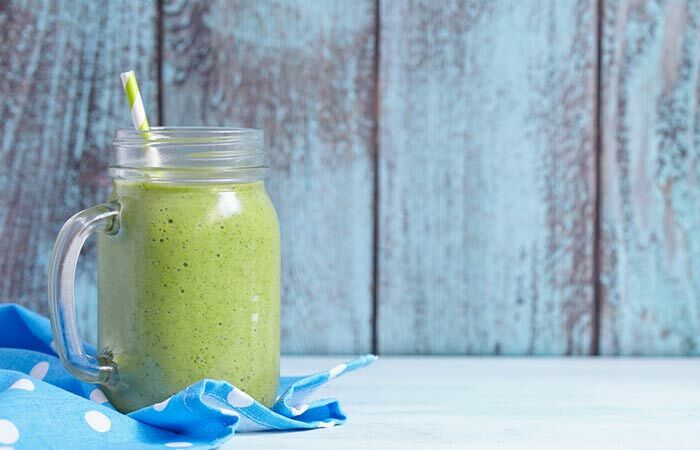 Toss the cucumber, orange, and green tea extract into a blender and give it a spin. Green tea helps to protect from diabetes, obesity, and cardiovascular diseases (73). Cucumbers are low-calorie and high-water content vegetable that helps to lower lipid levels and has anti-diabetic effects (74). Oranges are a rich source of vitamin C, helps to lower blood pressure, protects from asthma, arthritis, and ear infections (75). Mint leaves have anti-inflammatory and antioxidant properties that provide protection against digestive problems, relieves muscle pain and helps to soothe the skin (76). 1. Roughly chop the apple and dates. 2. 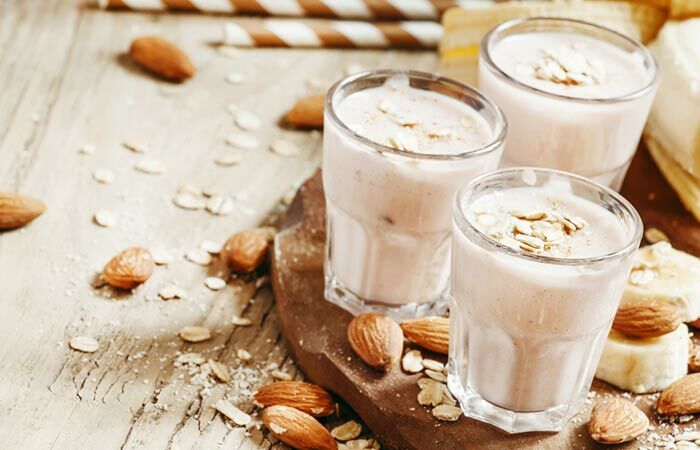 Toss the apple, dates, milk, and almonds into a blender and give it a spin. 3. Pour into a glass and dust the cocoa powder on top. Apples are rich in flavonoids, carotenoids, phenolics, vitamins, minerals and dietary fiber that helps to protect against cardiovascular diseases, lowers bad cholesterol and reduce the risk of diabetes and asthma (77). 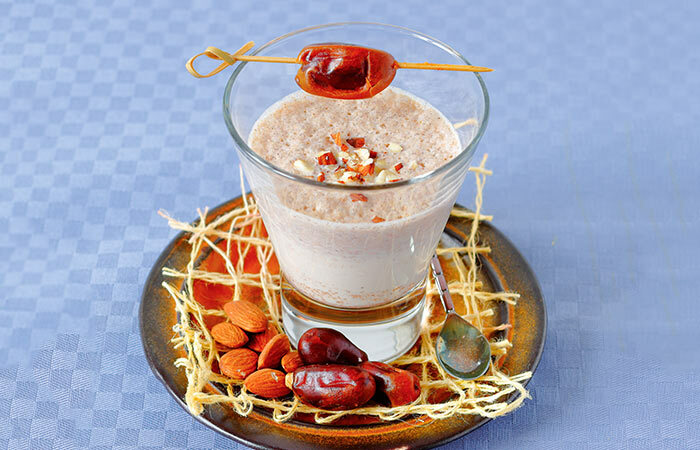 Dates are a rich source of vitamins B-complex and C, carotenoids, phenolics, and dietary fiber. It has anti-inflammatory, anticancer, and anti-haemorrhagic properties (78). Almonds are rich in healthy fats, minerals, and phytonutrients. It helps to reduce the risk of oxidative stress, obesity, diabetes, and glucose homeostasis (79). Milk is a rich source of calcium and helps to strengthen bones, reduces the risk of heart diseases, weight gain, and diabetes (80). 1. 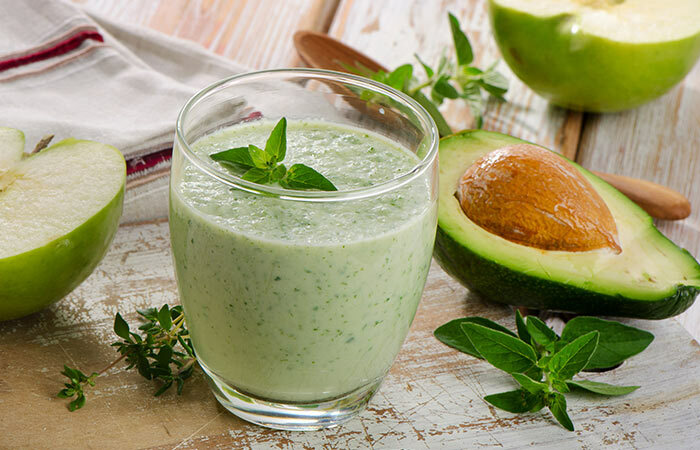 Toss the spinach, mung bean sprouts, mint leaves, and low-fat yogurt into the blender and give it a spin. 2. Pour into a glass and add a pinch of black salt. Spinach helps to lose weight by increasing satiety, reducing food cravings, and mobilizing fat (81). Mung beans are high in protein content and therefore can be considered as muscle food. It is also rich in vitamin K, folate, calcium, and phosphorus (82). Yogurt is rich in good gut bacteria that help in digestion, calcium, potassium, magnesium, and vitamin B-12 (83). Mint leaves have anti-inflammatory and antioxidant properties that fights digestive issues, relieves muscle pain and helps to soothe the skin (84). Use a mortar and pestle to grind the cumin and fennel seeds. 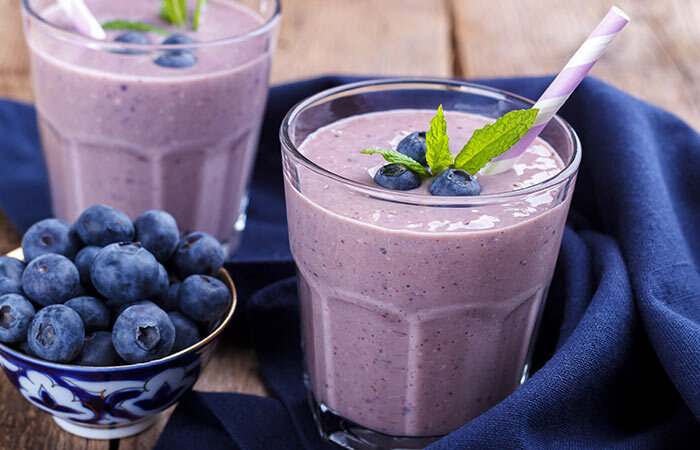 Toss the blueberries and ginger into a blender and give it a spin. Add buttermilk and ground cumin-fennel seeds. Stir well. Buttermilk helps in digestion by providing the gut with good bacteria. It also has diuretic properties (85). Blueberries are rich in vitamins, minerals, and dietary fiber. It helps to reduce belly fat, reduces the risk of Type II diabetes, prevents atherosclerosis, and improves memory (86). Cumin seeds aid digestion, prevent heart disease, and it is good for your vision (87). Fennel seeds, apart from being a flavoring agent, they help in digestion, fighting cold, and is an effective menstruation promoter (88). Ginger is rich in antioxidants, vitamins, and has anti-inflammatory properties. It aids digestion and works effectively against motion sickness and nausea (89). Toss the tomato and watermelon into a blender and give it a spin. Add coconut water and a pinch of black salt. Tomato is an anticancer agent, and it also helps to protect against cardiovascular diseases, obesity, high blood pressure, and diabetes (90). Watermelon helps to rehydrate cells and helps to keep unlimited cell proliferation in check, prevents cardiovascular diseases, diabetes, and improves vision (91). Coconut water is rich in natural electrolytes, and it also helps in lipid mobilization (92). 1. 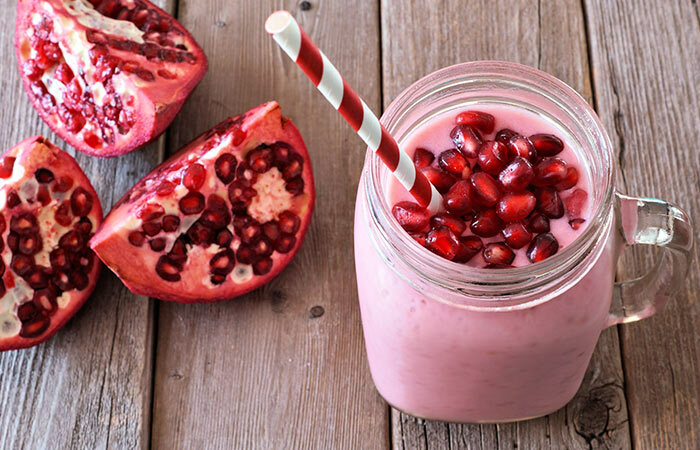 Blend the pomegranate and guava using a blender. 2. Pour it into a glass and add ground flax seed and salt. Pomegranate helps to lower high blood pressure and bad cholesterol levels, has antioxidant, anticancer, and anti-inflammatory properties ( 93). Guavas are rich in soluble fiber and potassium. It helps to lower blood lipid and high blood pressure (94). Flax seeds help to reduce the lipid levels in the blood and also protects against cardiovascular diseases (95). 1. 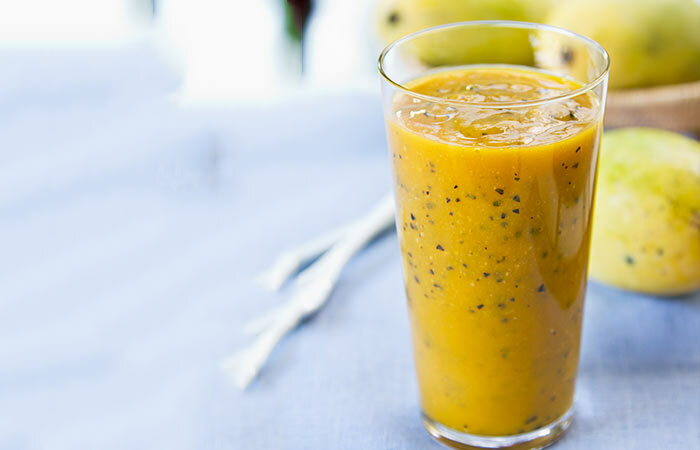 Scoop the passion fruit out and toss into a blender. 2. 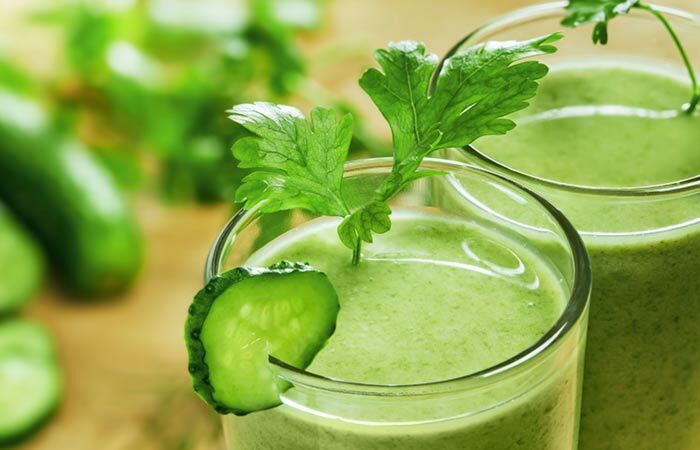 Add cucumber and mint leaves to the blender. 3. Give it a spin. 4. Pour into a glass and add a pinch of black salt. Stir well. Passion fruit is rich in minerals, vitamins, antioxidants, and dietary fiber. It is a laxative and helps to maintain healthy skin and mucous membrane (96). Cucumbers contain vitamins, minerals, and phytonutrients that help to soothe skin, lower lipid levels, is an antidiabetic agent, and prevent constipation (97). Mint leaves soothe the digestive tract, helps lower bad cholesterol and blood pressure, and provides effective relief from muscle pain (98). Grind the strawberry in a blender. Add ground pumpkin seed and a pinch of black salt. Strawberries are rich in vitamin C, manganese, and fiber. These red and luscious fruits have antioxidant and anti-inflammatory properties. They also help in regulating the blood sugar levels (99). Pumpkin seeds help to regulate insulin levels and provide protection against diabetes. It increases good cholesterol levels and soothes menstrual cramps (100). Peel and roughly chop the kiwis. 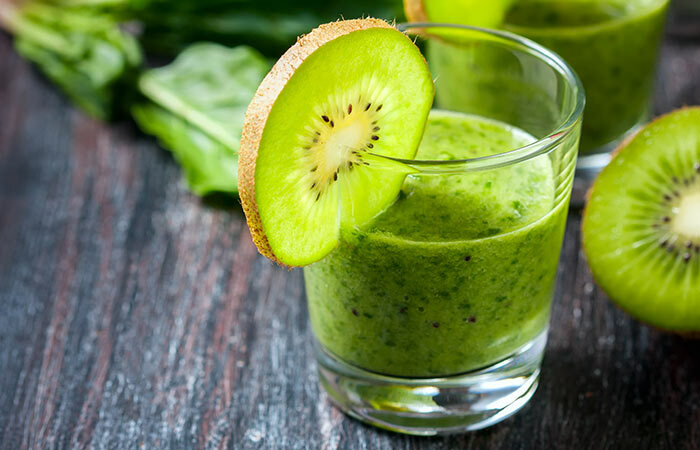 Toss the kiwi and spinach into a blender. Blend well and pour into a glass. Add lime juice and a pinch of salt. Stir well. The phytonutrients and vitamins present in kiwi protect the DNA from damage, scavenge harmful free radicals, provide protection from arthritis, asthma, colon cancer, macular degeneration, and improve cardiovascular health (101). Spinach is an excellent source of nutrition. It protects you from various types of cancer, macular degeneration, and strengthens bones (102). Lime helps to regulate digestion. It helps ease gastritis, heartburn, and constipation (103). Pour into a glass and add lime juice, cayenne pepper, and salt. Apples are a rich source of antioxidants and help to lower cholesterol levels, prevents cancer cell division, and protects against diabetes and asthma (104). Avocados are a rich source of vitamins, minerals, and healthy fats. It helps to reduce fat, lowers cardiovascular disease risk, and slows down aging (105). Lime helps to regulate digestion. It helps with gastritis, heartburn, and constipation (106). Cayenne pepper helps to lose weight by boosting metabolic rate, and it also prevents cardiovascular diseases (107). 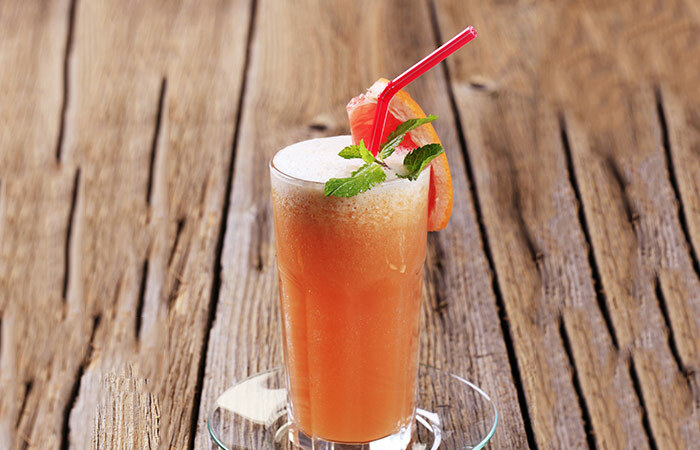 These detox drinks will show effective results and get your friends talking about the new you. Just make sure not to indulge in any foods that will bring you back to square one. 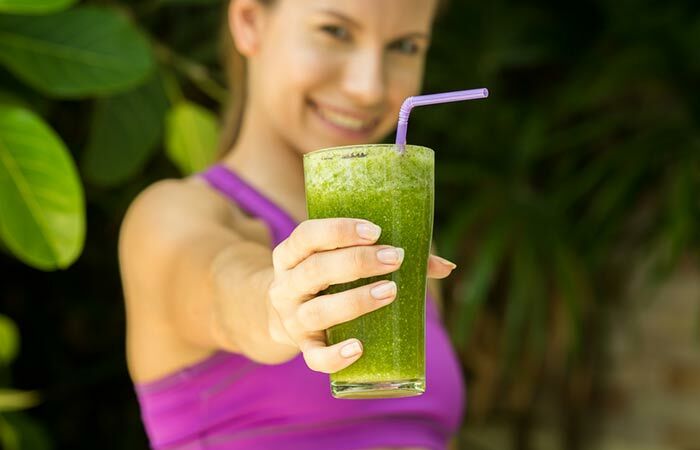 If you are thinking of making a significant lifestyle change, take baby steps and drinking homemade detox smoothies is the best way to start. 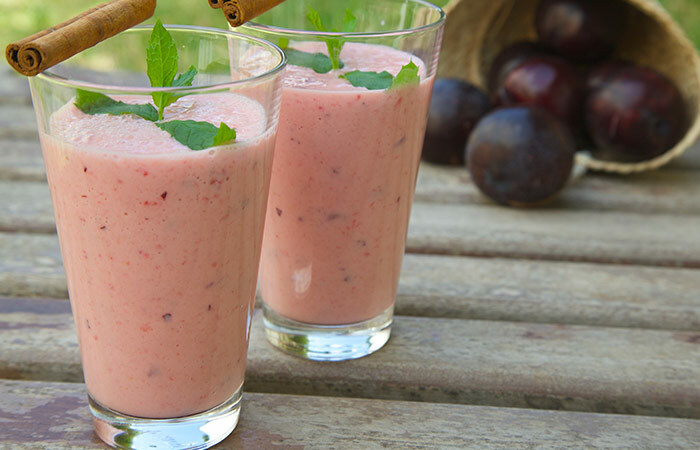 Do share your experience with you after you try these smoothies. Leave your comments in the box below. Can’t wait to hear from you.